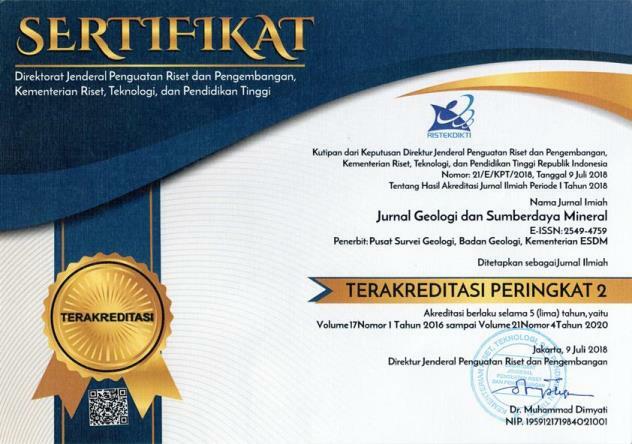 Jurnal Geologi dan Sumberdaya Mineral (JGSM) is an Indonesian scientific journal published by the Center for Geological Survey, Geological Agency, Ministry of Energy and Mineral Resources. The journal receives Indonesian or English articles. Those articles are selected and reviewed by our professional editors and peer reviewers. JGSM has been assigned as an Accredited Scientific Periodical Magazine by the Indonesian Institute of Sciences (LIPI) No. 596/Akred/P2MI-LIPI/03/2015 in 2015. Since February 2017, the JGSM has been published at electronic version of e-ISSN: 2549-4759 according to The Letter of LIPI No. 0005.25494759/JI.3.1/SK.ISSN/2017.02 started by Vol. 18, No. 1, February 2017. The journal is indexed in Indonesian Publication Index (IPI), Indonesian Scientific Journal Database (ISJD) and Google Scholar, the contents are freely available in electronic version. JGSM is published quarterly in February, May, August, and November.